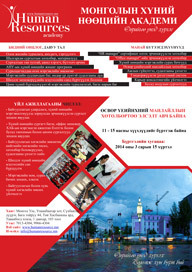 Established on July 9, 2007, the Mongolian Human Resources Academy is a professional non-governmental organization with the aim of making significant contributions, through training and research activities, to strengthening the capacity of human resources with leadership skills and with the ability to adapt to the changing world, promoting cooperation among human resources specialists, providing favorable conditions for the exchange of information and cooperation, and contributing to the human resources development in Mongolia through cooperation with reputable international human resources organizations and specialists. To carry out activities on a contractual basis in order to foster and develop human resources policy of business organizations. To make significant contributions to the human resources development in Mongolia through the introduction of the latest achievements in the field of human resources management into Mongolia and the building of intellectual fields for research and training. The reality of a problem is an OPPORTUNITY waiting for its solution rather than DIFFICULTY.